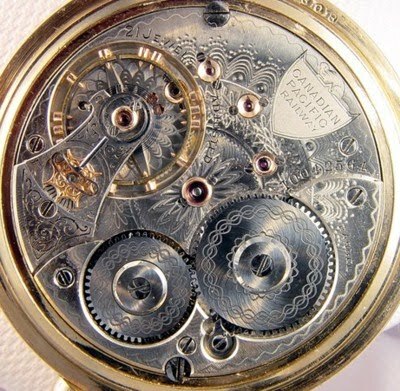 Waltham made a limited number of 21 Jewel movements for the Canadian Pacific Railway. It was made in two runs of open face and one run of hunting case movements. The first movements are found in run 7902501-3000, listed in the Gray Book as a run of Specials. The movements reported from this run can be found here. A run has been extracted from this run, based on the pattern in which the movements fall. The table below lists this created run plus the open face and the hunting case runs from Waltham's list. There are two variations of the open face movements because of the difference in the serial number posistion in each of the open face runs. As a point of interest, the 21 Jewel CPRs have winding wheels with the same damasceening pattern as the 845 and Crescent Street grades while the winding wheels on the 17 Jewel movements have the same pattern as the Appleton Tracy grade. 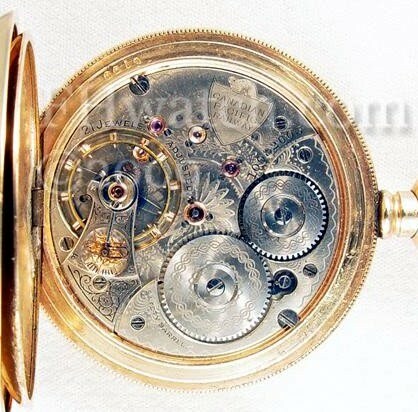 The 21 Jewel movements are not marked "Waltham, Mass." while the 17 Jewel movements are marked as such. A 21 Jewel hunting case CPR, serial number 10082603. Note the pattern on the winding wheels which is the same as found on 845 and Crescent Street movements. The pattern found on 17 Jewel CPRs is the same as what is used on Appleton Tracy & Co. movements. Photo courtesy Fred Hansen. A 21 Jewel open face CPR, serial number 10042564. Note the pattern on the winding wheels which is the same as found on 845 and Crescent Street movements. The pattern found on 17 Jewel CPRs is the same as what is used on Appleton Tracy & Co. movements. Photo Courtesy Fred Hansen.